And said: “Knight, welcome indeed to this place. The head of this hostel, Arthur I am called. But for I don’t want there to be, my clothing is gentler. The Gawain-poet takes on the Arthurian and the alliterative traditions in Sir Gawain and the Green Knight, as is aptly demonstrated in this passage from lines 250-278. In this scene, Arthur addresses the mysterious Green Knight who appears at the entrance to his hall. The poet begins the passage, noting “þat auenture” standing before Arthur’s court (1.250). This adventure, or marvel, alludes to the same “meruayle þat he he myȝt trawe, / Of alderes, of armes, of oþer auenturus” that Arthur seeks earlier before being seated for dinner (1.94-95). Arthur’s request for a tale of adventure is a traditional aspect of Arthurian literature. In this poem, however, it is revealed as a potentially childish request, as the poet takes on the tradition, exaggerating the adventure to one more dangerous and real than Arthur would perhaps have originally desired. The poet is also successful in portraying the noble courtesy that was traditional behavior for knights. Line 251 emphasizes this type of courtly behavior, utilizing alliteration of three words, as was custom in the alliterative tradition of the time: “And rekenly hym reuerenced, for rad was he neuer.” Arthur applies this same type of courtesy to the green guest, welcoming him, “Wyȝe, welcum iwys to þis place. /…/ Liȝt luflych adoun and lenge, I þe praye” (1.252-254). The alliterated words (wyȝe, welcum, iwys, and liȝt, luflych, lenge) emphasize the chivalric greeting given to the Green Knight, likely because of the high quality materials he wears, described in an earlier passage. It is important to note that by addressing the Green Knight in a chivalric manner, Arthur employs the formal and respectful “þe” (1.253), in comparison to the Green Knight’s disrespectful use of “þou” (1.272). 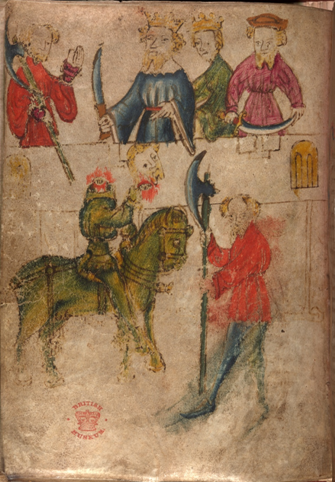 This foreshadows the sinister intentions of the Green Knight, corresponding with the likewise dual-natured description of his appearance in previous passages: the knight is ominously giant and green, but outfitted like a noble knight and is therefore difficult to define as specifically “good” or “bad.” The Gawain-poet hints at the Green Knight’s deceptive character a second time in this same passage, when the knight says Arthur’s court is “Preue for to play wyth in oþer pure laykez,” alluding to the subsequent beheading game, as “oþer pure laykez” indicates games rather than jousting (1.262). 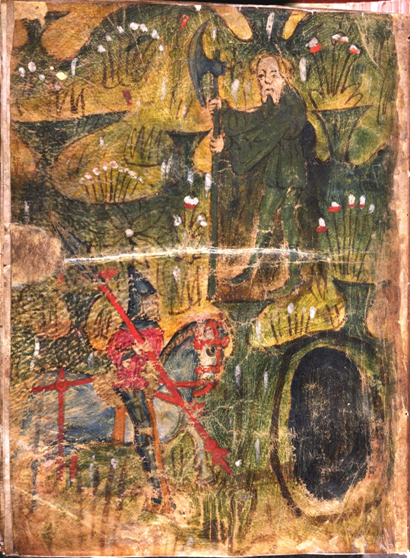 The Green Knight’s cunning deception can be seen as the Green Knight’s “oþer weppenes to welde” (1.270). The poet draws attention to these lines in the notable occurrence of translinear alliteration. Lines 270 and 271 both alliterate on long vowel sounds that begin with “w”: “Ande oþer weppenes to welde, I wene wel, als; / Bot for I wolde no were, my wedez ar softer.” The poet’s emphasis on these lines indicate to the reader that the Green Knight’s focus on appearance of clothing as indicative of his nature is important—should the knights trust that the Green Knight’s clothing and appearance can guarantee his real intent? Yet again, the poet serves at a critic of the court, suggesting a childish gullibility within it. Marie Borroff handles this passage well in her translation, maintaining most key aspects of the passage’s stylistic nuances. There are, however, significant alterations that sacrifice some of the poem’s integrity. Perhaps most significantly, her translation foregoes much of the allusions to the malevolent character of the Green Knight. Most obviously, this is lost where Borroff replaces both the words “þe” and “þou” with the umbrella-word, “you.” Any nuance in tone is erased with this replacement, resulting in a much more deferential Green Knight. The Green Knight’s previously discussed use of “ȝou” to address Arthur reveals the costume nature of his attire, as his language here disagrees with the noble appearance of his attire. A true knight would be required to behave and speak in the same chivalric fashion Arthur displays. Her choice of “you” is problematic in another instance in the passage, when Arthur returns the favor to the Green Knight, addressing him, “If þou craue batayl bare, / Here faylez þou not to fyȝt” (277-278). Arthur addresses the Green Knight with a reciprocating “þou” twice within the wheel structure; evidently the poet wants to draw attention to this change in language coming from Arthur. Borroff misses this emphasis on his change in tone when she uses the less nuanced “you,” writing “If contest here you crave, / You shall not fail to fight.” It is, however, important to note that there aren’t many modern equivalents for Borroff to choose from in terms of polite and impolite forms of “you,” so her loss can easily be attributed not to any oversight on her part, but to a true lack of modern equivalent English to select from. Borroff further fails in her portrayal of the Green Knight when she substitutes words and phrases so as to maintain the alliterative pattern of her translation. She translates “Preue for to play wyth in oþer pure laykez” (1.262) to “And peerless to prove in passages of arms.” While her translation succeeds in maintaining the rhythmic and alliterative integrity of the original, the meaning is twisted in such a way that it loses its original allusion to the beheading game (oþer pure laykez). Yet again, the Green Knight is portrayed without key allusions to his deception, losing the poetic nuance of foreshadowing. This occurs again in line 266: “Þat I passe as in pes and no plyȝt seche.” Borroff’s translation, “That I pass here in peace, and would part friends,” again prioritizes the alliterative style over meaning, and the Green Knight becomes the friendly giant, wishing to befriend the court before him. He assures them that his bearing of a traditional Christmas branch indicates his desire for peace, as was custom at the time. This is certainly not the case, as he, in reality, wishes to deceive and test them. The original verse is much more ambiguous, for it is unclear as to whose plight he does not seek—probably, he seeks no plight for himself and merely allows the possibility that there be none for the other knights, should they, of course, pass his test. This is yet another key example of the Green Knight waving the falsity of his appearance in the naïve court’s faces; he almost mocks the act of bearing a branch to represent peace and toying with the youthful naïveté of Arthur’s court. These nuances are all sacrificed in Borroff’s representation of the Green Knight, yielding the loss of poetic foreshadowing and poetic critique within the poem. The poet’s role as a potential critic of the court is made less pronounced in line 250 of Borroff’s translation, where she omits the word “auenture,” choosing “entrance” instead. This decision erases the implication that Arthur’s previously desired tale of marvel and adventure has been presented through the arrival of the Green Knight. The irony of the entire matter is lost and the poet loses one of his key criticisms. It is perhaps fitting, given her failure to portray the Green Knight’s allusions to his dangerous intentions, that she fail to present him as Arthur’s “auenture” to begin with. This alteration, along with many others, is very slight but also very pronounced when closer readings of the original text lend to truly wonderful poetic devices and subtleties that the translation simply lacks. The greatest attributes of the Gawain-poet are his nuanced and intricate style, playing performer, insider, and critic for and of the court, all at once. Borrof’s choices may have reflected ones necessary to best reproduce the poem in its stylistic character with a meaning as close to the original as possible, but her selections reveal the impossibility of doing so while maintaining the original’s subtle and well-crafted overtones. The knights’ likely attitude upon seeing the Green Knight enter their hall. Source: https://uploads.disquscdn.com. Original illustration in the Pearl-manuscript. Source: http://britishlibrary.typepad.co.uk/. Saw him wait at bay, beside his men. Draws out a bright sword and strides forth powerfully. Goes swiftly through the ford where the fierce one waits. That the many feared for the knight, lest the worst befall him. And the dogs condemn him to death. SyȜ hym byde at þe bay, his burnez bysyde. Braydez out a bryȜt bront and brigly forth strydez. Foundez fast þurȜ þe forth þer þe felle bydez.. This section of Sir Gawain and the Green Knight is from the second hunting scene. These action packed scenes of the men hunting various animals are interjected by scenes of Bertilak’s wife trying to seduce Sir Gawain in his bed each morning. Here we have interesting interplay between two different kinds of aggressors. It presents two manifestations of the passions of raw human nature, the sexual and the violent, while showing their overlap. On the one hand, we have the male aggressors hunting deer and boars for sport, and then we have the female sexual aggressor who is performing her husband’s wishes as she tries to seduce Gawain. The fast-paced violent action of the hunting scenes makes the scenes with Bertilak’s wife all the more intense and intimate. Bertilak also seems to be channeling his sexual energy and frustrations about his quest into the hunt. In the original text, through the vivid imagery and the fact that Bertilak has an audience of men who are holding their breath as he attacks the boar, the reader gets a real sense of the drama of the scene. Formally, there is a lot going on in this section of the poem which is true of Gawain as a whole; some elements include effective imagery, intentional alliteration, and allusions to elsewhere in the text. The most important part of this passage for me is how the Gawain-poet elicits visceral reactions through vivid sensual imagery. The reader can see the violent battle between the knight and the boar, experience the fear of both opponents, feel the anxiety rolling off the watching men, and, in the last line, the reader is repulsed and oddly satisfied by the final depiction of the dogs ending the boar. I will look into a few of these images in greater detail in comparison with Marie Borroff’s translation later in this blog post. As is the case throughout the entire poem, alliteration plays a huge part in conveying tone and meaning—and this section is no exception. One of my favorite instances of this occurs at line 1594, which reads, “Hit hym vp to þe hult. Þat þe hert schyndered.” With this forceful repetition of the “h” sound, the reader can almost hear the exhalation or gasp of the boar as Gawain strikes him. This also shows how reading the poem aloud can emphasize this effect of the words. Another interesting aspect to the Gawain-poet is that he cleverly foreshadows and references other moments in the story throughout the entire poem. In line 1593, the Gawain poet writes “Set sadly þe scharp in þe slot euen.” The careful aim and powerful movement of Bertilak in this line recalls the how Gawain beheads the Green Knight at the beginning of the poem. Overall, in comparing my translation with Marie Borroff’s, I noticed that there are fewer words in her modernized text. In this way, she still makes the encounter seem dramatic, but it is more about the conflict of the generic “Man versus Beast,” rather than the specific knight and boar. If we directly translate the passage, we get Bertilak’s own sense of urgency and the more visceral descriptions of the boar’s death. In this way, the Gawain-poet’s text is more immediate, intense, and personal. By looking at some of the problematic passages I found in the Borroff translation, I will show how her attempt for lyrical and relatable poetic language precludes the reader from gaining a true sense of the poem. For example, in line 1593, Borroff translates the phrase “Slips in the blade,” while I translated “Firmly sets the blade.” The effect of Borroff’s is to make it sound like Bertilak slipped the blade easily and even gently into the boar’s neck, like sticking a knife in pudding. In my translation, you see how Bertilak has to use force and precision as he makes the killing blow. It gives him greater agency and power, and seems like a more triumphant moment. Then in line 1595, we see the aftermath of the boar’s shattered heart. Borroff translates the phrase, “he falls in his fury,” while I said “and snarling he yielded.” Borroff’s phrasing recalls the language of epic poetry, with heaven and hell imagery as he falls dramatically. In my more direct translation, the boar’s death is much more rooted in reality. You understand the feeling that the boar is unwillingly yielding to the knight’s wishes. The knight is, once again, more of an active agent inflicting powerful force on the boar, forcing the boar to give in. This boar is violently aggressive and protests vocally until the end. Another problem for Borroff is her attempt to recreate an alliterative structure. Sometimes she does a nice job with either repeating the same consonant from the original text or choosing a sound with a similar effect, but she is not always that successful. In line 1583, the Middle English reads “He lyȜtes luflych adoun, leuez his corsour.” Instead of writing alliteratively, Borroff tries to retain the language of the Gawain poet by translating, “Lightly he leaps down, leaves his courser.” Because of this, Borroff alienates the modern reader by using an unfamiliar word for horse without even using it for her own alliterative purposes. Then, in line 1596 the Gawain-poet writes, “A hundreth houndez hym hent.” Borroff translates the line, “Hounds hasten by the score.” She has the repetition of the “h” in the two first words, but the latter half of the line completely lacks any alliteration. To her credit, Borroff keeps relatively the same number of syllables and captures the fast pace of the moment in the story. She does not, however, maintain the original effect of the alliteration. In the original, there is a gasping quality of the “h” which makes you hear the hounds pant as they sprint to the kill. Lastly, in line 1600, Borroff says, “And dogs pronounce him dead.” The verb choice makes it seem like the dogs ran over to the boar and listened for his failed heartbeat. It completely removes any sense of aggression and action. 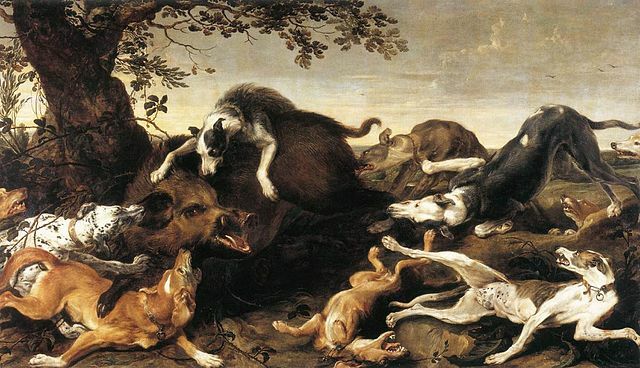 I, however, chose to phrase it with “and the dogs condemn him to death.” This infuses power in the dog’s instinctual action as well as a sort of dark primal form of justice to the text. In general, the Borroff translation is softened, with language that is trying to be poetic and flow smoothly, but unfortunately it simply softens the visceral effect of the poem. As is so often the trouble with translation, we have to make choices for what we can keep from an original text. We have to pick and choose certain elements: the original meaning of the words, the formal structure, or the tone- to name a few. 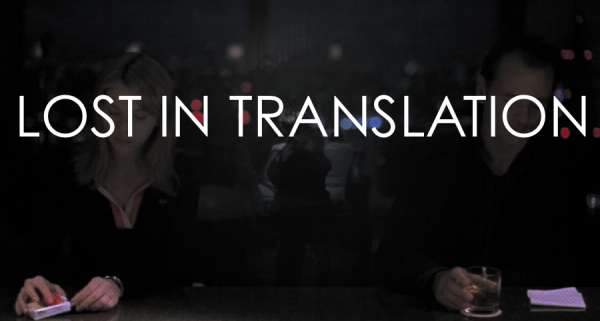 Unfortunately, as Billy Murray demonstrates while gallivanting around Toyko with a young Scarlett Johansson, some things are just Lost in Translation. The following is taken from Sir Gawain and the Green Knight, as Gawain and the Green Knight honor their agreement set a year prior. ‘Blynne, burne, of þy bur, bede me no mo! With the barbe of the blade by the bare neck. But save a cut to the side that severed the hide. That the sheen of blood over his shoulders shot to the earth. ‘Happily put away your sword, bid me no more! And therefore, noble, now stop! British Library MS Cotton Nero A.x; f. 125/129v. This passage signifies a release from the bounds of duty and agreement. 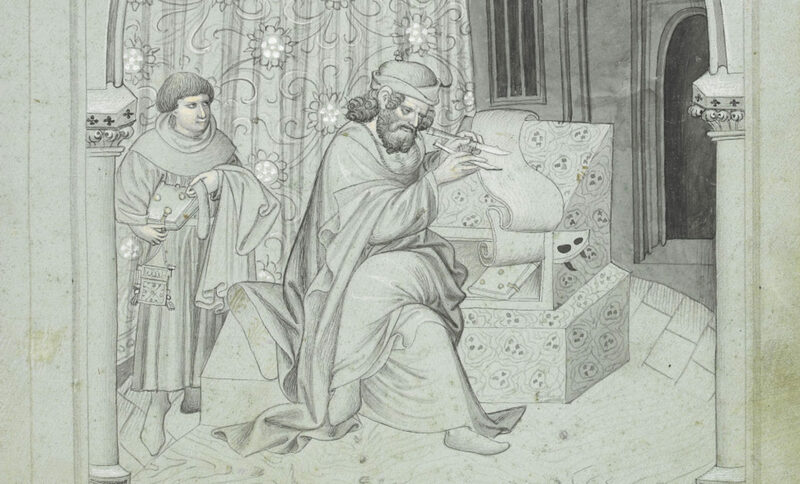 With it comes a physical element—the cutting of Gawain’s neck to bear testament to his encounter and compliance. This sign also marks a transition in the passage, as Gawain understands the significance of the bloody visual. In Marie Borroff’s translation, however, Gawain’s injury is described in more muted language, and as a result, transfers less weight to Sir Gawain’s courageous rebuke. In its original form, the passage is immediately characterized by the alliteration seen throughout the entirety of the work. While alliteration serves many purposes, its use within this passage is primarily to direct momentum and illustrate power. In the first line, the text reads, “He lyftes lyȝtly his lome, and let hit doun fayre” (2309). Immediately a sense of fluidity and elegance surrounds the Green Knight as he lifts his axe. This is due solely to the softness of the “l” sounds that fill the line, as repetition of these words creates a rolling sensation, providing an audible momentum to match the motion of the axe. The next line serves as stark contrast, since words such as “barbe”, and “bitte” (2310) have closed sounds that oppose the open fluidity of the line before it. As such, the first two lines together bear opposite tonal qualities and hint at broader significance. The parity of openness and closure fit both with the theme of execution—as one’s life is ended, and with the termination of Gawain’s covenant—as his contract is closed. These two possibilities are inherently at odds with each other. This is fitting, as in many ways, Sir Gawain and the Green Knight is a tale of opposites; chivalry and courtesy, loyalty and preservation, and desire and chastity are but a few pairs of conflicting forces that come to define the work. Within the sonic contrast in the first two lines, the poet embeds the struggle between Gawain and The Green Knight within the thematic structure of direct opposition. The Green Knight is dominant in the beginning of this passage. However, the distribution of power quickly shifts when Gawain sees his own blood splatter on the snow. To mark this transition, the poet begins the line with “and,” a word that has little sonic magnitude, making the word to a neutral marker. Both lines before this begin with “Þe” and “Þat” (2313,2314), while the two lines following begin with “He” and “Hent” (2315, 2316), respectively, and thus serves to further isolate this transitional line. Upon seeing the blood, Gawain realizes his pact is fulfilled and is thus placed on even ground with the Green Knight. The poet gives him an increasing amount of power as he speaks out against the knight. “Braydez out a bryȝt sworde, and bremely he spekez” (2319), writes the poet, mimicking the “b sound” that defined the action of the axe only moments before. This is further compounded in Gawain’s language, as he commands, “Blynne, burne, of þy bur, bede me no mo!” (2322). In total transition, and demonstrated through alliteration, the power held by the Green Knight now lies in the armored hands of Gawain. This transition of power and tonal clash, while still present in the Borroff translation, is not as stylistically developed. In place of soft “l” sounds, Marie Borroff opts for a line filled with “g” words that are more reconcilable with the “b” sounds that follow. Furthermore, Gawain’s moment of realization is softened in Borroff’s translation. The vivid—and grotesque—desription of bloodshed is greatly diminished in the translation, and as a result the moment of freedom, and thus the lynchpin on which power swings is transitively cast into shadow. What should be translated as a “stream” of blood “[shooting] to earth,” is written as a “little blood lightly leapt to earth” (2314). Such a softening of language mutes the gravity of the situation, thus undermining the theme of Gawain’s inescapable mortality that runs throughout the work. As such, Gawain’s transition into a bold figure is dramatically lessened in Marie Borroff’s translation and does not allow him to fully embrace the knightly values of courage and bravery.